The Alternative Color cmd.exe (Console) is often used and is very popular with Copy Paste and MDI Tabbed Interface! The MDI tab groups are convenient, and the ColorConsole interprets the output of cmd.exe, or powershell.exe in a RTF editor, which makes copying and pasting commands easier and more convenient, just test it, it's more useful on some tasks to work as directly in PowerShell, or the standard CMD! If you want to underline areas of the Cmd command output, eg for teaching or presentation purposes, you can do this directly in the ColorConsole before exporting. This saves a lot of time. ► Export the documents from the command prompt (cmd.exe)! 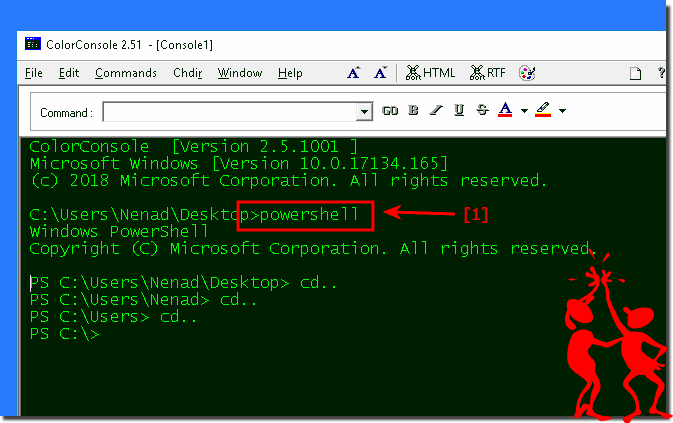 (Image-1) Run PowerShell commands in ColorConsole! ColorConsole - FAQ-6: Who needs the alternative cmd.exe and why?